Ever since the Europeans settled in the Yadkin River Valley attempts have been made to turn the river into a commercial waterway. Area residents were eager to make the river accessible for transporting their agricultural goods and products to other markets by linking the western and central parts of North Carolina to the eastern part of the state. In 1795 The N.C. General Assembly approved an act establishing the Yadkin Company Inc., to examine the feasibility of such an endeavor. The company failed; and in 1818 the legislature chartered the Yadkin Navigation Co. to explore the practicality of making the river navigable. Headed by two Wilkesboro residents, John Hixon and Hiram Jennings, the company determined the river could be made navigable from Wilkesboro to Salisbury for $57,330. Unfortunately, neither Hixon nor Jennings had experience in such an undertaking. 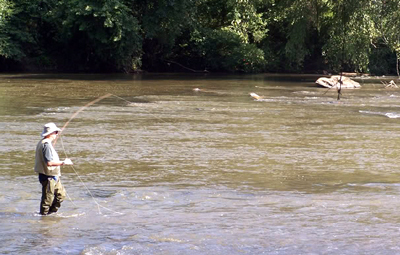 As part of this project, it would be necessary to navigate around Bean Shoals, an area of the Yadkin River with shallow water, granite shoals and rapids. A three-mile-long canal was proposed, requiring a dam and three locks to bypass the area at an additional cost of $30,200. Construction began in 1820 and the first of three locks were built at the head of the canal; and 45-foot wide channel was dug. A high bluff required construction of a stone retaining wall “of solid masonry, fifteen feet high, along a line of more than twelve hundred feet” in order to reinforce one side of the canal. The ruins of this wall are still standing and visible from the river. It is amazing. In this process small holes, about one inch diameter and from two-to-four inches deep, were drilled into the stone (no carbide-tipped power drills). Two shims were placed in each hole; and a metal wedge was placed between them. A person with a hammer hit each wedge until a crack appeared on the surface and the stone split apart. These drill holes are still visible on some of the remaining blocks. Looking at the retaining wall ruins, one can only imagine the human sweat and toil it took to cut the stones and the many men and mules required to haul the huge blocks from the river. In completing just this portion of the canal, the company had gone more than $8,000 over the budget. The retaining wall alone cost $27,000. Some accounts say the project was “mysteriously abandoned.” There was no mystery. The project was seriously undercapitalized from the onset. All work was halted due to lack of funds. The company issued a report in 1825 admitting failure. The canal was never completed or used. In the 1890s, a railroad bed was laid on top of the canal route and is still in use today. From the canal entrance just a quarter mile down from the put-in, you enter the thrill of going down Bean Shoals. This is an exciting challenge. Immediately you face a decision through which of three channels to proceed. These channels will be covered in my next blog. More later.